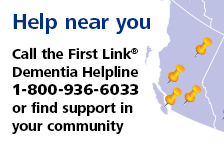 Family caregiver support groups | Alzheimer Society of B.C. Having a diagnosis of Alzheimer’s disease or another dementia, or supporting a person with this diagnosis, can be incredibly demanding. People in this situation experience a variety of feelings. The demands of the disease can make it difficult to stay in touch with friends and family, and can lead to loneliness and isolation. Learning about dementia, its progression and the impact it may have on individuals and families; and learning practical coping strategies. Encouraging caregivers to actively engage in protecting and maintaining their physical and emotional health. All of our support groups operate on the Information and Mutual Aid model. A place to exchange information, support and friendship with others whose lives are affected by dementia. A forum for sharing practical tips and strategies for coping with the many changes connected with the disease. An opportunity to decrease feelings of isolation and loneliness. A place to express feelings and be reassured that these feelings are normal and expected. A place to find a positive outlook on things without being misunderstood. An opportunity to develop communication and problem-solving skills. A place to access the most current information provided by the Alzheimer Society. The chance to regain some control in the face of a disease that cannot be controlled. A place to find a sense of hope. It is important to recognize that support groups are not for everyone who is in a caregiving role. Some people do not find group discussion helpful and prefer other forms of help, such as individual support or professional assistance. Similarly, a support group will probably not work well for a person who is not interested in hearing about the ideas and feelings of other people. A replacement for therapy or counselling. Some people may seek professional help instead of, or in addition to, attending support group meetings. A social gathering, although some socializing does occur. A formal educational group led by an expert. The emphasis is on input from all members based on personal experience rather than expert or professional knowledge. For information about Caregiver Support Groups in your area, please contact your local Resource Centre or see the First Link Bulletin for a list of upcoming dementia education and support programs in your community.